Nixion was not happy. And he decided to leave it at that. He didn’t want to go and see this war base. He liked violence, sure. He liked hurting people, sure. War, however, was nothing something he was particularly keen on. In any case, this was a war base. A war base that had been used hundreds of years ago. It was going to be dead boring. Deader than dead. It was going to be deaded boring. Slayn hadn’t been required to come. She’d been promised fights and apparently, Mist had told her that there wasn’t a high chance of a fight on this trip. So she’d lost interest immediately and returned her house. Why couldn’t Nixion have stayed behind and waited? He was confident that he’d be able to occupy himself in the Sanctuary until they got back. He’d find one of the other training rooms Mist had been talking about before, or else threaten a few of the idiot healers. That would have been a little bit of fun, at least. This was not fun. This was boring. This was annoying. Nixion was not happy. Admittedly, he was never happy. People always told him how he was never happy, always in bad moods. Of course, they soon discovered just how much Nixion valued their input when his fist met nose. Indifference aside, however, they definitely had a point. Nixion mostly found that the majority of all his emotions and intentions were dark and angry things. And he was fine with that. Those emotions worked for him. If it ain’t broke, don’t fix it. And if it is broke, who cares - just leave it. Nixion scowled as the minibus went over a bump and he swayed slightly. Damn, Nixion hated bumps. And he hated buses. The minibus was mini, but it was still a bus. He hated buses. Everyone else was talking amongst themselves, but Nixion was sitting down the back again, silent and scowling. He could have asked where they had got a bus, but he really didn’t care enough to bother. They’d all been driving for about forty five minutes now, and Nixion beginning to get seriously annoyed at the lack of activity to keep him occupied. Nixon didn’t even know who was driving, but evidently the location Gabriel had supplied Mist with was not close to the Sanctuary. Finally, the bus came to a halt. Nixion was the first off, despite being the furthest away from the exit, and everyone else piled out after him. He allowed himself a moment to appreciate that he was out of the minibus, then looked at the place they had stopped at. “This is it?” Nixion asked. For once, Nixion did not seem to be exaggerating. The place was a farm. It was a farm with a barn, a shack and a lot of field. The shack was also run down, as though it hadn’t been used since the end of the war – and it was likely that it hadn’t. This wasn’t exactly what he’d been expecting when the term ‘war base’ had come to mind. “You don’t need to be one to see that this place is pathetic,” Nixion shot back at him, ignoring the slip with his name. “Look around.” He illustrated his words creatively with a few gestures to their surroundings. Mist started walking towards the wreck, frowning, but only slightly. “Maybe it was better in its day,” he said flatly, shrugging. They all continued after Mist and made their way towards the entrance to the shack. Mist stopped in front of the decaying door and attempted to knock on it, but it collapsed off its hinges upon contact. He shrugged again and they decided simply to proceed. It didn’t look as though anyone was here anyway. Nixion certainly couldn’t see a legitimate reason as to why someone would be here. The place was boring – to say the least. They each split up and did a quick inspection of all the rooms. Each one was just as run down and old as the next, and the only thing any of them found was various forms of mould and assorted scampering vermin. Mahogany had actually found what seemed to be a snake. Though it looked a whole lot less like a snake after half the ceiling caved in on the thing the moment it moved. The floorboards were old and wooden, covered in grime and a thick layer of dust. There were a few sections where the floorboards had also collapsed and splintered, which everyone avoided. The walls were an unpleasant colour of murk, splattered with mould and more grime. 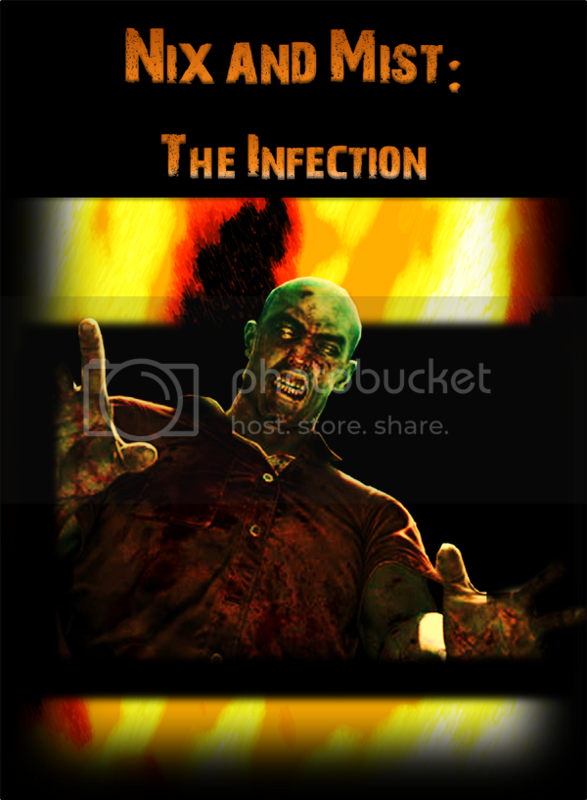 Though, Nixion had found a wall in the third room he’d searched with a large blood splatter over it. He’d smirked when he’d seen it, but it looked like it had been there for as long as the shack had been standing. The ceiling had a few thin cracks through it and cobwebs hung everywhere. The place also stunk of… something. Nixion couldn’t actually put a real description to the smell. It was just oldness. An unpleasant oldness with a hint of moisture and more unpleasantness. “Yeah, this place is a dump,” Mist said after they had checked all the rooms, which was a pathetically short amount of time. “Oh, really?” Nixion asked him sceptically. The others seemed to be content with listening and observing the situation. Mahogany had picked up a rat and was holding it by the tail, watching it dangle with unnerving curiosity. Mist directed them all out of the shack and they moved on to the barn. It took them an even shorter amount of time to discover that the barn was of nothing but hay, manure and a few odd looking animals with even odder eating habits. They left the animals to it and regrouped outside the barn. “Alright, looks like Gab lied to you, man,” Stavan said with a hand over his nose as they abandoned they barn. “Was an old war base,” Lyra interjected. Hunter ignored the conversation and wandered off in typical vampire fashion. Nixion assumed he wanted to get away from the barn - his scene of smell being so sensitive. Nixion watched the vampire walk into the corn field and then walk back towards them a few moments later. “Hey, guys, you might want to see this.” Hunter called to them in his lazy voice. Nixion scowled. Another cliché sentence. Everyone followed Hunter into the field with Nixion trailing behind looking disgruntled. The moment that Nixion stepped forwards into the corn, everything in front of him changed dramatically. In quick ripples, the rows of corn that should have been sitting in front of all of them faded and disappeared, in the place of which stood a huge castle through the ripples. Nixion stepped closer and the ripples calmed, allowing his vision to sharpen. It was a castle. Just by looking at it, he could tell that it had been built for its defence and not for its looks. It was horribly old, though not decaying, and looked strong. Strong enough to hold off an attack, presumably. It was a rather imposing image. There was a short few moments of silence in which everyone took in the sight in front of them. “So, Sir Nixion, what be your expert verdict on this particular stronghold?” Stavan asked him, flashing a cocky smirk. Nixion gave him a withering glare in return. After a few more moments, they began their walk towards the castle. While the stacks of crop wasn’t really there and wasn’t visible any longer, it was still a bit of a walk to the castle. It was all hardened ground with a few patches where grass had attempted to grow but had failed and died miserably. Upon closer inspection, Nixion noted that the castle actually was slowly falling apart, but the structure itself was still rather impressive, and was in no immediate state of crumbling to the ground. A part of the far end had been damaged and had already collapsed, but the rest of the castle was still standing and while it held wounds evidently from wartime, it was still intact. They reached the entrance and stepped inside. It was dark inside the building and the only provided light was streaming through the few windows throughout the castle. There were chandeliers hanging from the ceilings and candles along the walls, but the chandeliers were no longer working and the candles had long since burned up. “Alright then,” Mist said after they’d looked around a bit. “Everyone split up into pairs and search this place. We’re looking for anything that might help us or any sign of a person in this place. If anyone finds anything…” he raised his phone a bit to indicate they should call, and then he turned away and walked in a direction that half forced Neon Dark to fall into stride with him. Stavan left with Hunter, Lyra turned in the other direction with Kali leaving Nixion with Mahogany who was examining the sleeve of her shirt intently. She looked up, realised that they were alone, turned to look at Nixion and smiled brightly. “Hi!” she said far too happily. Nixion rolled his eyes and walked towards the last corridor out of the main room. Searching for any clues whatsoever proved to be a lot harder than it was all cracked up to be. For a start, Nixion had no idea what a clue was meant to look like. Just like the shack, the path Nixion seemed to be walking down was covered in dust and withered with age. There were no footprints as far as he could see, but then again, Nixion could barely make out the ground because the windows were few and light was thin. Searching took a long time. It took a while, but Nixion eventually got frustrated and ended up hurling his fist into some rusty old suit of armour which promptly proceeded to collapse on top of him. Even empty armour can beat me now Nixion thought to himself angrily as he kicked the suit off himself. He got up at they continued onwards after Mahogany had finished laughing. Mahogany inspected every chair they passed, every painting they walked by, every window to come into view and every wall alongside them. Despite all this, she was completely and utterly useless, and fascinated over the tiniest of cracks in anything rather than keeping on the lookout for anything of any real use. Nixion grew irritated of her quickly and spent half his time making sure he’d remember to ask Mist if he could swap watch partners with someone. Not the necromancer, he’d never do. The vampire wouldn’t work either, someone would end up dead before long… Kali would have been fine. He’d ask if he could swap with Lyra. Mahogany was driving him insane. Again. They passed a few rooms built to branch off the main corridor, most of which were empty. They stumbled over a certain room which had evidently been the armoury of the castle during wartime, then abandoned and left alone when they’d all deserted the place. Nixion left Mahogany to inspect a window outside the room and spent fifteen good minutes inspecting the weapons in the place, liking what he saw. He even took a hatchet and kept it for later use. He would have taken one of the axes, but none of them fitted in his jacket. They’d left the armoury and continued on their way. There was another room that actually had a door blocking their path. Wondering what could have been so important as to keep the door locked even while the place was evidently deserted, Nixion had decided to remain there attempt to force it open. Even though he hadn’t consulted her on this matter, Mahogany hadn’t seemed to mind in the slightest and busied herself by examining a crack in the must floor with a large amount of interest. He’d rammed his shoulder into the door at full force for two minutes or so when the sound of Mahogany’s phone filled the space around them. It was an upbeat song full of happiness and rainbows and other horrible things that Nixion would like to stamp on. He stopped ramming the door as she answered the phone. She listened to it for a few moments, nodded as though the person on the other end could see her, and hung up without saying a word. Mahogany replaced the phone in her pocked and then continued to examine at the crack, attempting to work out whatever it was that she was trying to work out. “What was that?” Nixion asked after it became clear that she wasn’t going to tell him. “Oh. That was Zathract,” She nodded thoughtfully and turned back to the crack. “What did he want?” Nixion asked through his gritted teeth, resisting the urge to punch a hole through the door behind him. “He wants us in the dungeon.” She told him dreamily. She frowned, prodded the crack with her finger and gave it a bizarre look. Nixion stared at her with bemusement for a moment, then turned and walked away before someone ended up dead. Nixion, after several wrong turns and a small fight with a crowd of deadly cobwebs, eventually found his way to the entrance to the dungeon, where everyone else was waiting. “Where’s Mahogany?” Mist asked him as he joined them all. Nixion’s response was to simply shrug. He’d ended up back where he’d left her twice on his long and epic journey downstairs, but she barely even moved. Crazier than me, he thought. “I’m here,” a voice said from above them called out dreamily, and everyone looked up to see Mahogany hanging from the rafters. “I’m not even going to ask,” Nixion muttered. They found the girl in the dungeon. The room she had been standing in did not look very inviting. It did not look very bright, it did not look very clean and did not really look like much at all. It was dark and damp, and most of the space was filled with various instruments that looked like they had been used for torture. At the sight of the instruments, Nixion glared darkly. The girl was sitting in the middle of the room when they walked in, shaking in fear. She was a thin thing, no muscle at all. Absolutely useless in a fight. Unless, of course, she had powerful magic. Damn magic, ruining fights. Nixion hated magic when it was used it fights. Unless it was his magic that was better than everyone else’s, of course. Unfortunately, however, it rarely was. There was no real reason to be wary of her. She was shaking like a leaf, her eyes cold with fear, and her body rigid, seized up. She was in no position to attack them, even if she had wanted to. The girl looked up at him slowly and fearfully, her eyes bloodshot. She was shaking horribly by this point. “Why are you here?” Mist demanded in a louder voice, causing the girl to flinch and shut her eyes tight before opening them again. She opened her mouth, like she was going to say something, but then looked down at her shoes and stayed silent, continuing to shake. Nixion narrowed his eyes, observing the girl. Her fear was genuine, as far as he could see, but he wasn’t about to let his guard down. His hand had already enclosed around his machete handle. His gaze shifted to Mist. Nixion could see the anger and the need for answers in the way his eyes were narrowed and through his rigid posture. His fists were clenched and almost shaking as well.Lyra put her hand on Mist’s shoulder, forcing him to drag his eyes away from the girl, though Nixion could tell he did it with reluctance. Mist looked at her for a second, and Nixion thought he was going to snap at her. But a moment later the hint of a growl was gone from Mist’s face and his shoulders loosened slightly, while his expression relaxed too. Fists still clenched, he nodded, and looked back at the girl. Stavan and Hunter stepped toward her and each placed a hand on her shoulders. The girl gave them both a look of pure terror as they did this, but when they began to leads her out of the dungeon and out of the castle, she kept her head down and eyes shut as if hoping they’d simply forget about her somehow. Mist gave a grim smile as the others filed in front of the two of them. “It means we’re getting closer,” he said. And walked out after everyone else. “Yay us…” Nixion murmured quietly as he followed them. The girl was led into the minibus but the ex-Cleaver and the vampire, and was seated next to the weird girl. She had been slightly worried as to how she’d do this if she was seated next to one of the team, but this girl seemed determined to draw a giraffe on the window by fogging it up, and was spending most of her time freaking out about how she couldn’t find a way to colour it. While the strange girl next to her proceeded to rub her finger into the glass with an increasing aggressive manner, Hammond’s assistant reached into her pocket and sent the text message that she had written out earlier. And the text said: Everything is ready. The last part with italics was slightly confusing, but I'm pretty sure it was supposed to be like that. At first, I wondered who the girl was, then I thought it might be Hammond's niece, but then I thought you'd say that instead of assistant so now I'm not sure. You guys are leaving me guessing! That's a good thing! But good to see a new chapter! It was written really well, especially with the confusion-mind-twister part at the end. Great. It's great. I guess considering we've had nothing since October it would be hard for this not to be great. But really. It's great. It has really good characterisation in it. Like .. . it's awesome how Zathract might be evil and might not; it's really . . . it really makes you think. :) And also, you're looking at everyone else to see how they are, too. 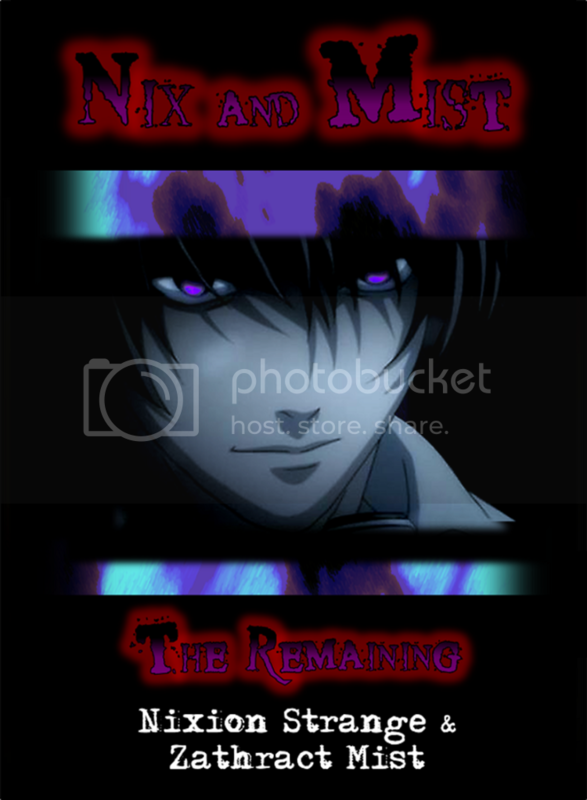 :) And Nix is obviously awesome, and he has really good character development. Also, the plot is awesomely intricate. :) It has different aspects to it, and I like the mysteries in it and how confusing it can be. The last bit was all twisty and stuffs, which is really good. I'm sorry, but . . .